MORE THAN 300 MILES LONG AND 400,000 PEOPLE STRONG, the 1st Assembly District is no easy place to run for election. But eight people -- four Democrats, three Republicans and a Green -- are trying anyway, and with the March 5 primary almost a month away, the campaign is being fought in earnest. Who deserves the right to represent the North Coast? 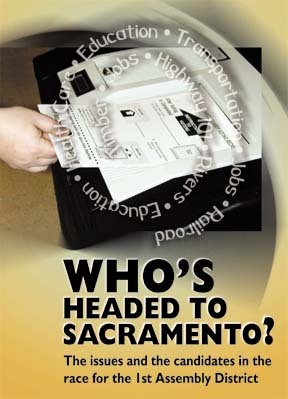 Who has the integrity and skill to navigate the political waters of Sacramento? The contest between Republicans, Democrats and Greens will not occur until November's general election, but for the two major parties this primary has major significance. For Republicans, the primary will be about selecting a candidate who can buck the odds by bringing home victory in a heavily Democratic district. Democrats, on the other hand, figure this seat to be theirs. With a 15 percent edge in voter registration, the 1st Assembly District isn't considered in jeopardy. From the Democratic point of view, March 5 is the real election, because the person they pick will have a major edge come November. 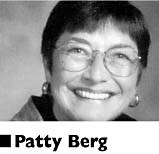 The Democratic favorite so far is Humboldt County's own Patty Berg. The founder and former director of the Area Agency on Aging, Berg is the smart bet for three reasons: She's the only woman in the race, she's the only Democratic candidate from Humboldt, where the largest group of Democrats are registered, and she is identified with seniors and senior issues. As politicians know well, seniors vote. "I think I'm going to win," she said in a recent interview. "She has to be considered the favorite," said Tim Stoen, a deputy district attorney from Mendocino County running for the Republican nomination. "She comes from the largest county, she has the money, and she is a woman against three men." It is a point that has not gone unnoticed in other camps. 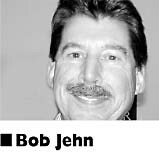 Cloverdale Mayor and insurance broker Bob Jehn, Mendocino College administrator Jim Mastin and Lake County Supervisor Ed Robey have gone to great lengths to make sure the public knows they are still in the game. The Robey camp even produced a press release last week extolling his "lead in early polling." "Robey [is] leading the Democratic pack with 22 percent and Humboldt County social worker Patty Berg is running last in the field," the press release claims. Never mind that calling Berg a social worker is about as accurate as calling Mario Andretti a taxi driver. And Robey's alleged "lead" is actually a mere 3 percent. 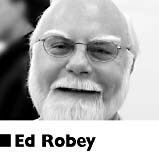 With less than five weeks to go and voters not paying much attention, one can scarcely blame Robey for trying. The "little woman from Humboldt," as she is affectionately known in campaign circles, is putting immense pressure on her competitors. She knows the issues, is the only candidate who is retired and free to run full time, and she has more than $50,000 left with which to convey her message. The one candidate who has the money to mount a campaign of comparable size is Jehn. The tall man with an easy smile is gaining a reputation as Berg's only real threat. He not only has enough money -- with a war chest of $50,966 he actually has just $25 more than Berg -- he also has some experience in Humboldt County. As the past director of the North Coast Railroad Authority, he is familiar with infrastructure and economic development efforts in Humboldt. He worked on the transportation portion of Humboldt County's Prosperity! economic development report. And as an insurance broker, he is familiar with the issue of affordable health care. Jehn is optimistic about his chances. He points to a poll he commissioned just before Christmas: "The good news is that no one in the race has any name recognition." That means while Jehn (pronounced Jean) is an unknown quantity, Berg is as well. Where does this leave Mastin? With only about $25,000 left and without a high-profile presence in Humboldt County, he is playing to his strength: that he's a genuinely nice guy. "I believe I will win against my fellow Democrats," he said. 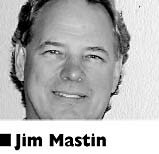 Mastin has garnered the support of a few Arcata notables, including City Councilmember Bob Ornelas and City Manager Dan Hauser, and has been making himself visible. He attended a Six Rivers Planned Parenthood breakfast and went shopping at the North Coast Co-Op, shaking hands and putting his relaxed charm on display. Short on money and time, he is mounting a grass-roots campaign by default. "We'll be doing a lot of precinct-walking," he said. For Republicans, there are two questions to be decided in the primary: Who would you most like to have represent you in Sacramento, and who do you think stands a chance of winning the election? At the recent candidate's forum hosted by the Eureka Republican Women's Club, Stoen called himself a "compassionate conservative" and calmly explained that he was in favor of moderate regulations and social programs. Quite a contrast to his rival Clay Romero, a gun dealer and machinist from Willits. Romero had exulted the group of party faithful with attacks on "socialist" policies like gun control and environmental regulation. He may have devoted more time to raking ex-President Clinton over the coals than to his own platform, but the fiery rhetoric was greeted with a chorus of agreement during the speech and shouts of approval afterward. Stoen's moderate words didn't get the enthusiastic applause of Clay's call and response, but his last point had to hit soberly home with the realists in the audience: "I'm here to tell you that you need to choose someone who can debate Patty Berg. That's me." In a district with about 50 percent more registered Democrats than Republicans, any GOP hopeful has to be able to bring in a lot of support from centrist Democrats. That's why many may feel drawn to Stoen, who lacks the zealous conservatism of either of his competitors but has an even more valuable asset -- crossover appeal. Not everyone is buying it. Rob Brown, Lake County supervisor and the third Republican candidate, said Stoen was just "stealing an image that worked well for George Bush." "That is not the way to win an election," he said. "I'm not sure he knows exactly who he is, politically." But how does Brown, a classic pro-business conservative opposed to environmental regulation, hope to win in a Democratic district? He said he hoped his straight-shooter style would carry the day. "I try to be as blunt as possible," he said. "And whether they agree with it or not, people respect someone who will give their honest opinion." Can a true-blue conservative get elected in the 1st Assembly District? Stoen thinks not. "I am the only Republican if you want a winner," Stoen said. 59, retired director of the Humboldt-Del Norte Area Agency on Aging. Area Agency on Aging. Worked with state and national legislatures to get legislation for elders adopted. Personal qualifications: "I agreed to seek the party's nomination after many friends told me that a take-charge, know-how-to-get-things-done woman with my experience and background was needed in Sacramento." Timber: "Sustainable growth." Supports management based on science as defined by California Department of Forestry. Railroad: Supports freight and passenger service. "Not having that rail has put our area at a competitive disadvantage." Rivers, fish: Restore the Eel River health, however much water that takes. "Who's to say if [the reduction in the diversion to the Russian River] should be reduced 15 or 25 percent? We have three endangered species." From which users should the water be taken? "Probably agriculture." Jobs: Integrate jobs and the environment. "The two are not separate issues." Every county should create an economic development plan like Humboldt's Prosperity! and coordinate efforts. Education: Increase state funding, reduce class size, improve schools' physical condition. Make sure standardized testing doesn't result in poorer schools getting even less money. Sen. Wesley Chesbro; Assemblywoman Pat Wiggins; Humboldt County Supervisors John Woolley, Paul Kirk, Bonnie Neely and Jim Smith; The AFL-CIO, Teamsters; California Professional Firefighters; California Federation of Teachers; and the International Association of Machinists and Aerospace Workers. 57, health insurance broker, mayor of Cloverdale. North Coast Railroad Authority, Sonoma-Marin Area Rail Transit Commission, Humboldt County Prosperity Transportation Advisory Group, Cloverdale City Council, Sonoma County Economic Vitality Project. Health care. "Our health care delivery system is very close to being completely dysfunctional." Raise MediCal and Medicare reimbursement rates. Timber: Review state regulation to make it simple and fair, especially for small landowners. "Potentially we need to overhaul the whole system." Railroad: Former chair NCRA says he's committed to restoring rail service through the Eel River Canyon to Eureka. Abandoning the line is not an option, especially in light of environmental cleanup costs. Rivers, fish: Backs plan to reduce Eel River diversion to Russian River by 15 percent. Long-term: recycle water. "Recycling could cut Russian River water usage in half. We're gluttons for water in this country." Jobs: Diversification to replace jobs lost in timber. In Cloverdale that has meant courting software developers and light manufacturing. "What the state needs to do is provide the resources so communities can implement programs [like Prosperity] and create jobs." Education: Continue educational reform. Better teacher pay, vocational education and smaller class sizes. Fortuna Councilmember Cliff Chapman; Ferndale Mayor Jeff Farley; Max Bridges, executive director of the NCRA; Windsor Mayor Steve Allen; Sebastopol Council-member Robert Anderson. Ukiah mayor, councilmember, planning commissioner, nonprofit economic development adviser. If it ain't broken, don't fix it. "I want to continue the work of Virginia Strom-Martin and Dan Hauser." Timber: Forest Practice Rules are adequate. "They just need to be followed." Logging regulators need better funding. "The burden that has been placed on CDF makes it almost impossible for them to do an adequate job for either the environment or timber." Railroad: First priority is opening the line from Willits south, then look at the Eel River Canyon. "Whatever it takes, my concern is to make it environmentally and economically viable." Rivers, fish: "I believe we may be able to reduce the [Eel River] diversion by 20 to 25 percent without seeing any significant impact on the Sonoma side of the equation." Sonoma County Water Agency needs to better manage its resources. Jobs: "There is no magic bullet." Government should help small businesses become an engine for job growth, including providing consulting services on financial and technical questions. Education: Vocational training. "We need to have a trained workforce for the jobs that are available these days." Dan Hauser, former assemblyman and Arcata city manager; Humboldt dairyman Dennis Leonardi; Arcata Councilmember Bob Ornelas. Faculty Association of California Community Colleges. Clearlake City Council, Lake County supervisor. The environment. "The environment is an integral part of every debate and discussion we have." Timber: Opposes clearcutting, supports public land acquisitions. Admits he is unfamiliar with players in Humboldt: "Aren't there timber companies up there that don't clearcut?" Railroad: "I like railroads; they get big trucks off the highway" but doubts viability. "Maybe they could repair [the rail line] from Willits south." Rivers, fish: Supports the 15 percent reduction in the diversion from the Eel to the Russian, but needs to see the proposal. Jobs: "Customize your strategy for your own area. Look around and see what industries you can grow." Education: "A lot of work needs to be done." Specifically, more money for schools, from elementary through college. Opposes standardized testing as a basis for allocating money. California League of Conservation Voters. California Nurses Association. California Union of Safety Employees. 41, Lake County supervisor, Kelseyville business owner. School boards and Lake County supervisor. State government's control over local issues. "We need a representative in Sacramento who understands the impact their decisions will have on us." Timber: Regulatory system overdue for an overhaul. "The CDF process ... is cumbersome and doesn't support industry and jobs. Getting a THP is like trying to get an audience with the pope." Less weight to environmental concerns. Railroad: "We don't have a railroad in Lake County, so it's something I am educating myself on. [However] continually dumping money into it shows a lack of intelligence." Rivers, fish: Unsure about reduction of Eel River diversion. Suggests scientific research regarding rivers and fish may be biased. Jobs: Get the government off the people's backs and jobs will create themselves. Plus, "There are a lot of jobs that could be created without this ultrafear the ultraenvironmentalists have imposed on us." Education: Raise teachers' salaries to a statewide standard regardless of where they live. Reduce administration spending. "We spend $18 million on the county Office of Education in Lake County and it serves almost no educational purpose." California Young Republicans, Lake County Sheriff Rod Mitchell. 41, machinist and gun dealer. Mendocino County Republican Party Central Committee. Gun control doing away with it, that is. Romero entered the race because a state law classified $12,000 of his firearms stock as unsafe and therefore unable to be sold. "I look at that as a form of socialist gun control." Timber: Timber industry backer, believes forests are healthier when managed "like a crop." Fish populations are not harmed by logging. And those who say otherwise? "I don't think they are really trying to protect the environment so much as they are just anticapitalist." Railroad: Restore rail service for freight but not passenger service to Eureka. Rivers, fish: "We are going to have to build more holding areas, reservoirs and dams." Jobs: Manufacturing and timber. "People who want to switch to a tourism-based economy are in for a rude awakening." Education: "Somewhere between the money being authorized for schools and the local school system receiving it, money seems to be disappearing. I suspect that if I dig hard, there might be someone out there upset enough to want to cause me bodily harm." Bring back the Ten Commandments and Pledge of Allegiance to schools. "Right now, I haven't gotten any groups to endorse me." 64, Mendocino deputy district attorney. Centrist appeal. Calls himself a compassionate conservative, moderate Republican, pro-life and pro-business. Stoen has done legal work for environmental causes. "I am the only Republican candidate if you want a winner." Timber: A la Teddy Roosevelt, "Conservatives should conserve; don't spend the principle of your investment." If more environmental protections are needed, use a carrot, not a stick: "We have reached the saturation point for regulation and need to reach out for incentives." Railroad: "I support the railroad even through the Eel River Canyon because the Humboldt economy needs that, especially in conjunction with the port." Passenger as well as freight service: "It may be a huge problem and require continued subsidies, but I think it should be rebuilt." Rivers, fish: Reducing the diversion from the Eel to the Russian is "not a solution." Supports building extra water-storage capacity to anticipate population growth, even if that means building extra dams. Fish are important, but so is agriculture. "The pear orchards and vineyards are at risk down here." Jobs: "We as a district need to have a business plan that attracts high-tech industry." Backs industry that has "a light footprint." Education: Back to basics. "We need a well-defined sequence of goals centered on English, math, history, geography, science and fine arts." Too much bureaucratic dead weight in educational system. Most significant, his boss. Mendocino County DA Norman Vroman has become popular with his own quirky brand of conservatism, blending liberal views on drugs with fierce defense of firearms rights. Former Congressman Don Clausen has also thrown his weight behind Stoen. 31, wildlife photographer, real estate agent. Parent-teacher organization at Sunset School. Land preservation in Trinity County. "It's one of the main reasons I am running: Trinity County was just added to the district." More protections to Trinity's extensive national forest holdings are needed. Timber: Closer scrutiny of herbicide use on private lands. "I'm looking at either banning or severely regulating herbicides." Critical of CDF:. "The forest practice rules do not get enforced because of the governor's office." Railroad: A low priority. "At this point, I feel the state doesn't have the money for it. If we have the money, we should be putting it into education, then a tax cut." Rivers, fish: "I strongly support giving more water to the Eel, as well as the Klamath and Trinity. The most important thing are the wild runs of salmon. If people have to water their lawns a little less, so be it." Jobs: Calls for state assistance for small businesses and microenterprises. "I would meet with economists and business owners and get a feel for what's happening and how the government can best help." Suggests state-backed low-interest loans for small business expansions. Education: Top priority. Favors smaller classes, better salaries for teachers. Humboldt State University Professor William Devall; Ken Miller, McKinleyville physician; Arcata author Joan Dunning. War chest: Empty so far.